Hey lovelies~ For today's fashion review, I bring to you two adorable items from Yumart, a Taiwan-based Storenvy shop with cute, girly clothing and accessories! 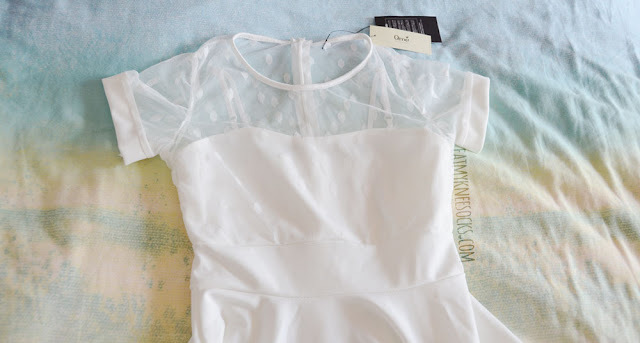 Yumart is one of the cutest stores that I've ever found, so I was literally jumping out of my seat when my package arrived, containing a denim waist bow skirt and a white polka dot mesh dress. Review ahead! From the moment I first found Yumart, I was instantly obsessed. 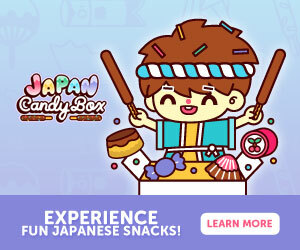 Everything from the store logo to the website to the actual products is super cute, and I knew that I had to try out their stuff! 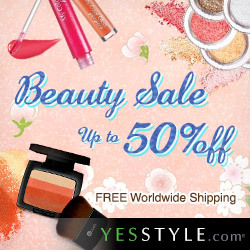 There are so many Asian fashion Storenvy shops these days, but Yumart certainly stands out from the others. 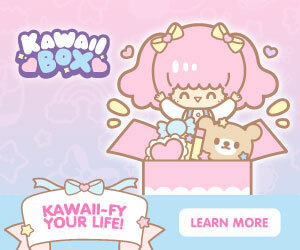 While a lot of the Storenvy/Tictail/etc. 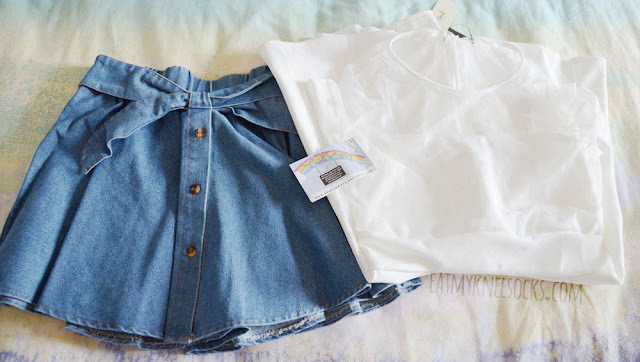 shops sell the same few products, Yumart sells cute clothes that are hard to find anywhere else! 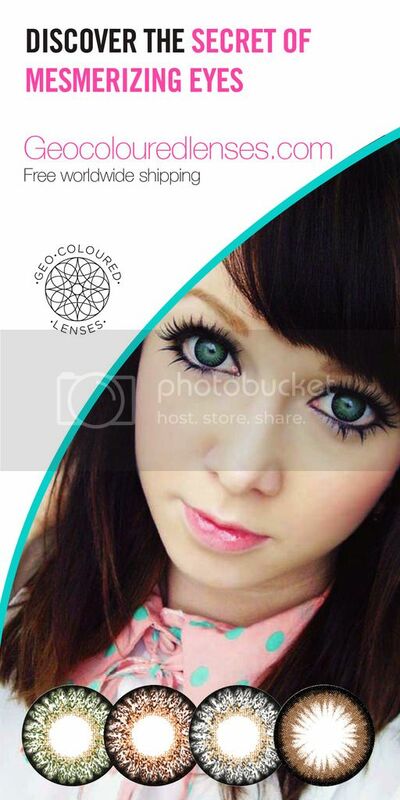 Their items are all originals from reputable Taiwan brands, packaged and shipped out from Taiwan. Here's a screenshot of some of their new arrivals. 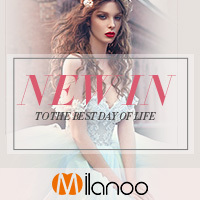 They have tons of lovely stuff, with lots of flowy tops, lace accents, pastel clothes, and simple yet stylish designs. 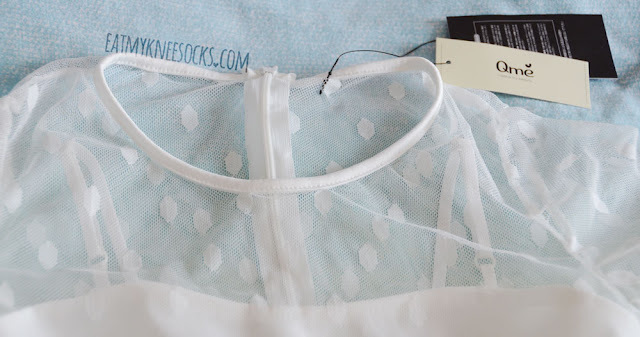 The lovely owner was so kind and friendly, and I picked out two of my favorite products, the denim waist bow skirt and white polka dot mesh dress, to review! My package was shipped out in under three days, and delivery took just five days. The items arrived in perfect condition, with all original tags as well as a super-cute Yumart business card. 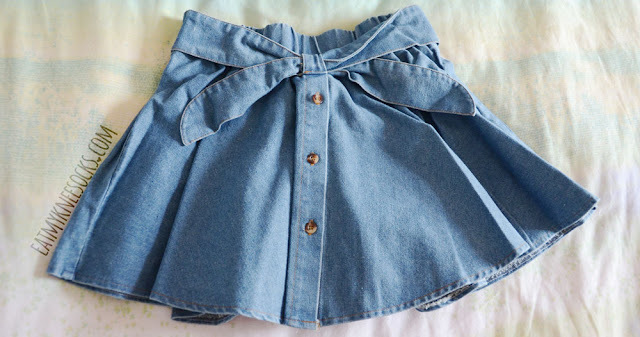 The first item that I got was a denim skirt with a bow design and row of buttons along the front. Yumart sells this skirt in sizes small and medium, costing $20. 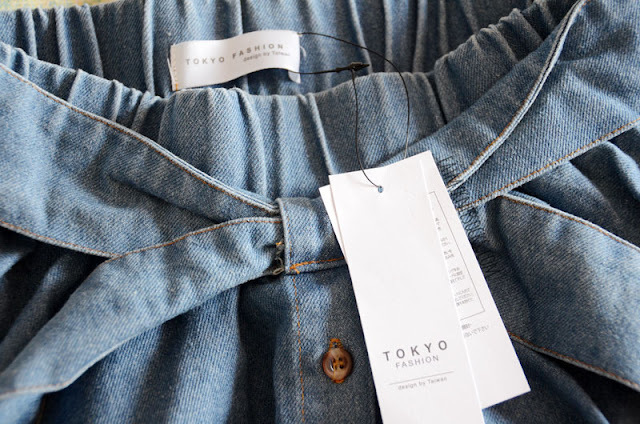 The denim skirt came with all original tags. It's slightly wrinkled from delivery, but it looks and fits exactly as pictured and described on Yumart's product page. This skirt has a stretchy waistband and adorable bow-tie design. It's pretty short in length (35 cm for size small, 37 cm for medium), which is great for petite people like me. I got the skirt in size S, and it fits perfectly! Yumart's bow skirt is a casual yet girly skirt, with a super-flattering flared silhouette. It's made of a crisp denim fabric that helps it keep its shape, but is also pretty comfortable to wear. The quality in general is great, and I really can't find anything that I don't love about it! Here, I'm wearing the skirt with a sleeveless white crop top, but I've found that it's quite versatile. 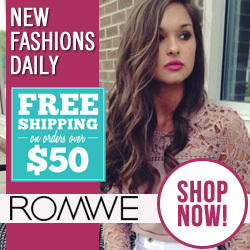 You can wear it with a crop top or bustier top for a flirty look, or with a baggy T-shirt for a laid-back look. 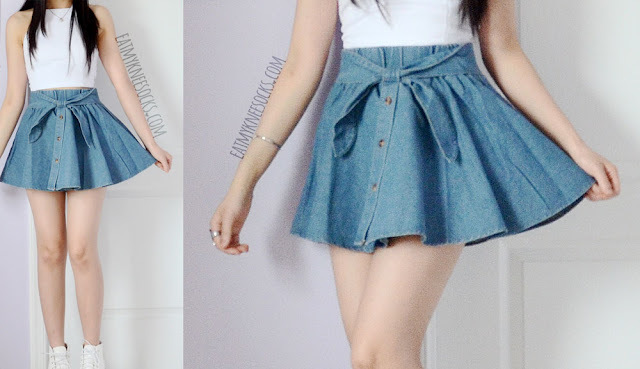 Overall, I'm very pleased with Yumart's denim waist bow skirt! It's a wonderful fashion staple for anyone who is a fan of casual, comfy clothing with a touch of cuteness, and it looks like it'll last for quite a while. The second item that I got from Yumart was a polka dot mesh dress. This dress, like the skirt, also costs $20, and is sold in two colors (black and white) and one size only. As with the skirt, the dress came with all original tags attached. I didn't know whether I wanted the dress in black or white, but I ended up picking white since I don't have a lot of white dresses, and white dresses seem to be super popular for the summer season. The material for the dress is stretchy and high-quality. While many white dresses or white clothes in general tend to be too see-through to wear alone, this polka dot mesh dress is made of a relatively thicker and more substantial fabric, so it's not sheer at all, but it's also lightweight and breathable! The dress is quite short in length, just about 75 cm as described on Yumart's product page. Taller people might want to be wary of this, but for me the dress cuts off at the perfect place, and I couldn't be happier with the length. The dress has a fit-and-flare silhouette with a sheer polka dot neckline, along with short sleeves with a solid white trim. The zipper on the back makes it easy to wear, though it tends to bunch up a bit at the top when I wear it. One of the things that surprised me about this white mesh dress is that the top half is actually made of two separate layers: a mesh overlay with the short sleeves and polka dot design, and a solid white layer with a sweetheart neckline and spaghetti straps. The straps are adjustable too, which was unexpected (but appreciated). For $20, this white polka dot mesh dress is an amazing find. It's a sweet, simple, adorable white dress that's both extremely comfortable and extremely cute. The quality is a lot better than I'd expected, too! Yumart sells adorable clothing, bags, and accessories from popular Taiwan fashion brands, and everything is priced affordably, with many items selling for $20 or under. I'd rate my experience with Yumart as a 10/10, or even a 11/10 if possible! 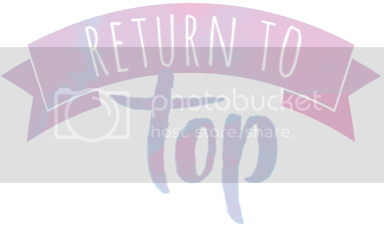 Their site is cute and easy to navigate, the prices are reasonable, shipping is lightning-fast, the items look exactly as pictured, and the quality is quite impressive. 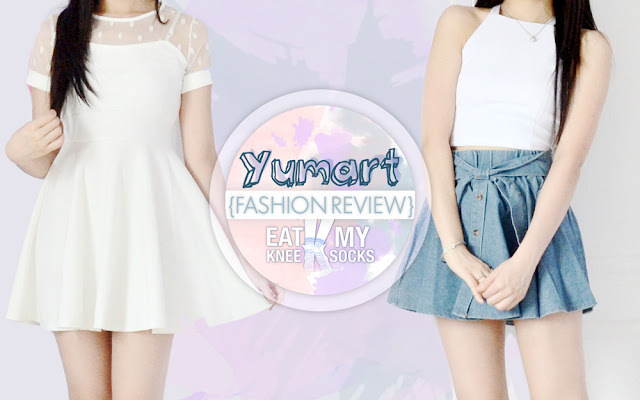 If you're into cutesy, sweet, ulzzang-esque fashion, I really recommend Yumart!